OAKLAND, Calif. (AP) — Once Jared Goff and the Los Angeles Rams offense got started after sitting out the entire preseason, they couldn't be stopped. 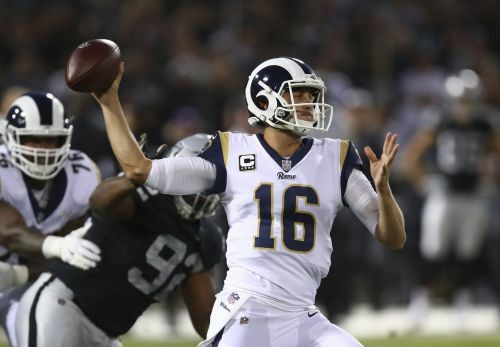 Goff threw two touchdown passes, newcomer Marcus Peters returned an interception 50 yards for a touchdown and the Rams used a dominant second half to spoil coach Jon Gruden's much-anticipated return to the Oakland sideline by beating the Raiders 33-13 on Monday night. "There was a little bit of feeling it out, seeing what they're going to do, seeing what their scheme is," Goff said. "I thought our defense did a great job of responding as well as our offense. I still don't think we played up to our standards in the first half. Think the second half, we came out and we did." Goff and the rest of the offensive starters for the Rams (1-0) didn't play at all in the preseason, and many of the top defensive players also got little time on the field in the exhibition games. That might have contributed to the shaky start. The Raiders (0-1) moved the ball relatively easily and the Rams struggled to finish drives. But Los Angeles flipped the script in the second half, outscoring Oakland 23-0 and showing why this team is considered one of the favorites in the NFC after last year's breakthrough season that ended with a division title. "I think for us to be able to go through a little bit of adversity and have to come back from behind going into the half, that was a good test of your resolve as a football team," coach Sean McVay said. "It was certainly a good job by those guys and I thought the offense responded." But there were only boos by the end of the night after Peters iced the game with his touchdown return on Derek Carr's third interception of the game. "It was a tale of two halves," Gruden said. "Obviously we did not take care of the ball and that was a critical part of that football game." "I did the Beast Mode," Peters said. "That's what I did." Gruden's second stint started well with the Raiders taking the opening kick and driving 75 yards for a touchdown on a 10-yard run by Lynch. The Rams had Lynch stood up at the 3, but he powered his way into the end zone with help from a push by his offensive linemen. "It was one of the dumbest plays you could have," Carr said. "I knew what I should have done as soon as that play was over." The Raiders barely touched Goff all night just over a week after trading star pass rusher Khalil Mack to Chicago for a package that included two first-round picks. Bruce Irvin had the only sack when Goff held the ball too long and there were few other pressures. Gruden's defeat dropped the league's new head coaches to 0-7 in Week 1. The Raiders once again had issues with penalties, committing 10 for 145 yards in the first half alone thanks to two long pass interference calls against Rashaan Melvin (37 yards) and Dominique Rodgers-Cromartie (50). That's more yards in penalties than they had in any game during Gruden's first four-year stint and the most in the first half for any team since at least 2000. The Raiders had one penalty for 10 yards in the second half. Raiders long snapper Andrew DePaola injured his knee in the first quarter and didn't return. TE Lee Smith filled in and provided accurate snaps on two field goals. He had a high snap on a punt but Johnny Townsend leaped and brought it down with no issues. It was a far cry from the 2012 season opener when Jon Condo got hurt for Oakland and Travis Goethel came in and botched three snaps in a loss to the Chargers. "It was stressful, I can't even lie to you guys," Smith said. "I'm just glad they all got back there." Rams returner Pharoh Cooper left in the second half with an ankle injury. Lynch sat once again during the national anthem. Lynch also sat for the anthem all of last season but never gave a reason for his decision. Rams: Host Arizona on Sunday. Raiders: Visit Denver on Sunday.